Jackie, you’re one of the organisers of the HERE COMES THE SUN! event on Saturday 12 April. What can we expect? Well, its full title ‘HERE COMES THE SUN! Solar on your rooftop, solar for your community, your school – and more’ helps explain that. It’s at St Michael’s School on North Road (N6 4BG) and people are welcome to come along any time between 11am and 3.30pm – whether it’s for the whole time or just a quick visit. They will find an exhibit area, where a range of solar installers are showing different types of solar panel and will be able to answer questions. And there’s a talks area too – about eight speakers during the day, with each talk lasting about 15 minutes. Again, people are welcome to pop in and out. Plus around 10 local householders will be available to chat with people who want to find out about their experiences with solar. 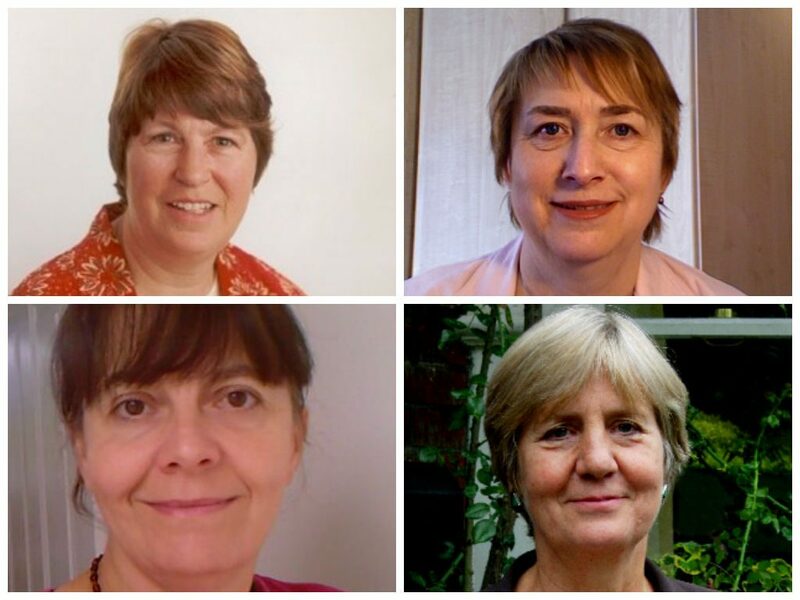 To register for the event and find out more details please use this link http://ow.ly/uyPEF. Broadly, which topics are covered? First, the two technologies: solar PV (photovoltaics) – those are the solar panels that generate electricity from sunlight. And solar thermal – a different kind of panel that produces hot water, and can even heat (not unusual now in Austria and Germany). But we’ll be showing how they work at large and small scale, and putting them into a wider context – such as solar lamps in Africa and the amazing 9 gigawatts of new solar power installed globally this year alone. Isn’t solar still quite expensive? Will it really pay off? Looking at it purely financially, yes – for a large system to generate electricity on a house it’s about £6,500 – but then it does pay back well in terms of savings (on electricity you don’t need to buy) and income from what you generate and sell. There’s a summary of the latest numbers here http://www.solarcentury.com/uk/solar-pv-still-nice-little-earner/ (bear in mind that in town it’s more likely that you’ll have a smaller system). And just this week the government has introduced a payment for each kilowatt hour of heat generated by a solar heat system too. We hope to see householders who think they might want a solar roof, plus people who might want to see solar on a local school or community building – or business. And others who want to find out more about community solar, which is becoming a very popular investment for a few pounds or more significant amounts (some schemes are EIS-eligible). What got you into organising the event? 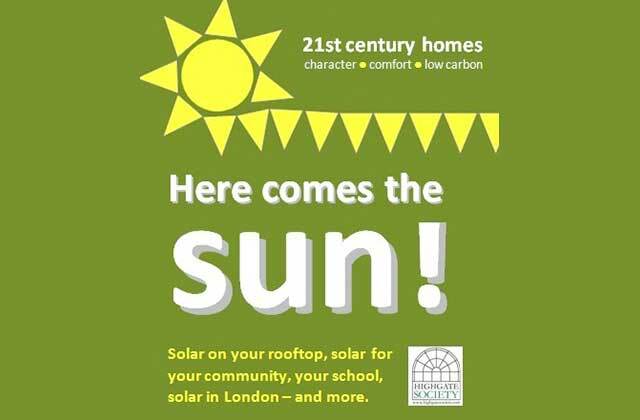 It’s the next natural step for the Highgate Society’s Sustainable Homes group – as part of our ‘21st Century Homes: character – comfort – low carbon’ initiative. In fact, all those of us organising the event have solar on our own roofs. Personally, I’ve spent some 15 years working in renewable energy as Editor of an international publication, and arranging events for professionals in the field. What is the HS Sustainable Homes Group all about? Can anyone join? Yes, we’d love some additional members! What we are mainly about is informing and encouraging local people to upgrade their homes so they offer 21st Century levels of comfort but without huge fuel bills. And of course we are all aware of our 21st Century responsibilities in terms of reducing emissions from fossil fuels. Many people want to know what they can actually do – we are just trying to help them find out. As regards solar, of course we appreciate that some people don’t like the way that solar looks – but there are some very slick installations now. It’s a matter of finding the right balance, isn’t it, especially in conservation areas. … and how about your own home – do you use any solar yourself? Oh yes! And how I love to watch the electricity meter spinning backwards, and to see that we have a 300-litre tank of hot water from the sun. Of course there are days that it’s not so effective. But it continues to give me a thrill that just sunlight can deliver the energy to run our home much of the time (and often with plenty to spare).